I had a big party that required prizes and made 14 or 15 gifts for and I forgot to take pictures of! Also a whole bunch of baby clothes that I've given away. I am so bad at that! So the stuff I CAN take pictures of it stuff for me and baby N and the boys that I've made. I have 2 quilts almost done that I will post when they are finished, but for now, here is some random stuff. I apoligize for the bad lighting and basic camera. Some of the things are way better in person, but the color is a bit off here. So these first 4 items are things that were made out of an old tie-dye dress that really didn't look good on me anymore. The boys liked it so I made them PJ pants out of it and made baby N a few hats- and it's not gone yet! Next we have some onesies that I fancied up for baby N. Hopefully he is not too chunky at first, because applique makes the shirt not as as stretchy. Here is the diaper bag I made. It is Amy Butler's "Everything Bag" diaper bag, so of course I had to use some of her fabric too. All the crazy layers of interfacing is what killed me, though, making the divider was hard. Don't know that I'd ever make it again, but I like how it turned out, and I'm excited to use it. Made some new wetbags. For those of you who are ??? these are waterproof-fabric-lined bags that zip or close with elastic to keep wet/soiled (cloth) diapers in until you get home. I like that they are washable and more opaque & breathable than a breadbag or ziplock. They can be pricey, so I'm glad I can make my own. These are a few of the pocket diapers I made for baby N once he gets a little bigger. I made 12. Happy Pioneer Day! In honor of the pioneers, we are all sick (mine has turned into a lung infection probably because of asthma, and I hope M's doesn't, since he has asthma too) but despite it have been doing some fun things here and there. Last week was the annual primary bike parade. The boys had fun decorating their bike and scooter. M was way out in front and enjoyed it a lot. This was way different from last year, where I pushed him on a trike. We should have just pulled E in a wagon again this year, because he didn't even make it out of the first cul-de-sac, and the DH had to carry him and his scooter several blocks to where I was watching in the shade to drop off the scooter and helmet. Oh well, I'm sure next year he'll be tearing around on a bike. Last Saturday, my awesome dad, husband, and dad's friend moved my shed to the cement pad that was once a dog run. It makes way more sense than having a shed on rocks and an empty cement pad. THANKS guys! From Saturday until Wednesday, we were in Boise enjoying Grammy & Pops, cousins, and all the fun activities there. 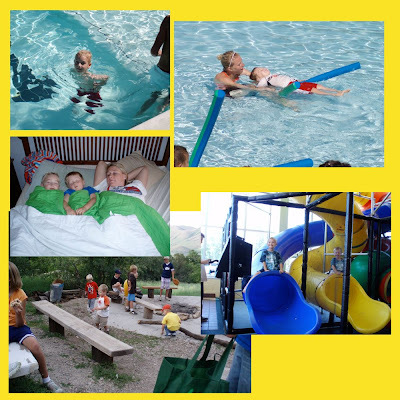 The kids enjoyed a playzone called Rafiki, Carl's Jr. with a great playplace, swimming in the neighborhood pool a few times, and the boise zoo. We had a great meal with the family there and it was good to just have a few days of not cleaning or worrying about my home and yard. Of course, the MIL and I managed to fit in a few quilt shops during the visit. We have slowed down since coming home (mostly going to dr. visits) but managed to buy a box of sparklers and light them in our backyard tonight in celebration of Pioneer Day. The boys each managed to burn themselves, leading me to re-evaluate how smart it is to give burning sticks to little kids. (not that the tradition will be squelched at all, I'm sure) And in case you are wondering how I am feeling at 30 weeks pregnant in July- the answer is VERY HOT. Seeing if he's taller than an emperor penguin, decides he will be when he's 6 like cousin E.
These are the 5 cousins (out of 8) that went to the zoo, it was a fun time! It's been a usual busy July here, with 4th festivities, swimming lessons, a lot of bike riding and Popsicle eating, and a ward camp out. 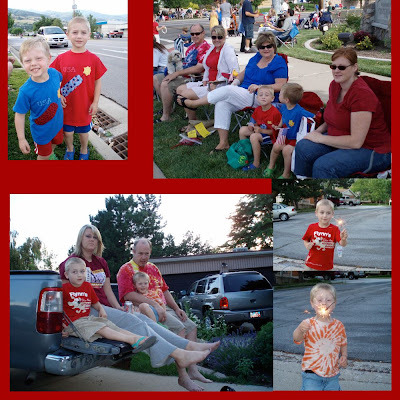 Fireworks at Grandma & Grandpa's and the Centerville Parade. 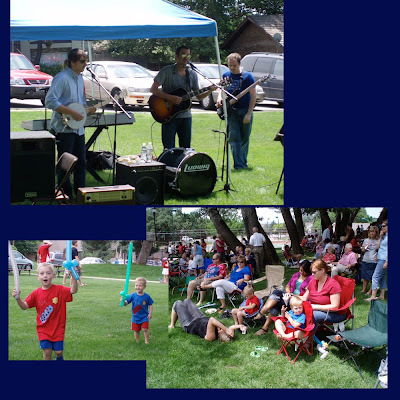 The annual picnic where my brother Chase's band, Bandolier, plays each year. 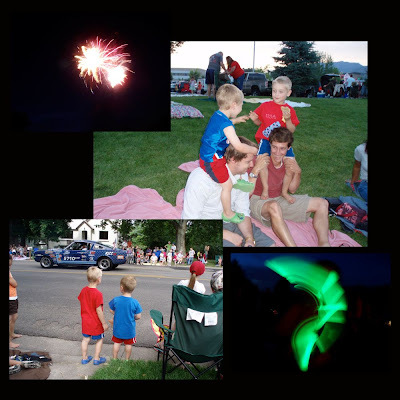 Davis Fireworks, complete with chicken fight, and the Farmington Festival Days parade. (below): Swimming lessons last week and this week, lunch at McD's, chillin' at Grandma's while Daddy installs a ceiling fan, and the ward camp out. This month there is still a lot more to come with a trip to Boise, a bike parade, pioneer day fun, and my birthday! I have been doing a ton of sewing on top of it all (and growing a baby) so not much on the blog side of things. Maybe I'll get around to taking pictures of the millions of things I've been sewing and post them here, but usually I give them all away before I remember. I won't forget to post a picture of N's quilt when I'm done with it, though.